Don't worry friends, I'm still around ... but I've been quilting like a mad thing, and it's crazy busy here too. I promise to have a newsy post for you really soon, honestly, I promise!! and I'm sure I will be for a good long time yet. It's a lucky thing I love to hand quilt, and it has been cold, so it's nice to snuggle under the quilt sandwich. It's my aim to move the hoop once per day, and I've pretty much been able to do just that. This is my favourite area of quilting at the moment - but I'm fickle and my favourite area changes almost daily. Loving table runners and toppers! This runner is made with some of our wonderful Adelaide girl Michele Hill's range of fabrics. The fabric is a border print from Morris Meadows - Michele's amazing fabrics are inspired by her love of all things William Morris. I'm lucky enough to have some of this fabric, so I'm definitely going to make one of my own. I'll select some binding fabric while I'm at the shop tomorrow - I see some binding and hand stitching in my future! Yesterday was such a lovely day. We headed up to Mannum with my parents to visit with my Nanna, it's always so nice to see her. Of course Mum loved the table runner, and I had flowers for both Nanna and Mum too. After lunch, we set off for a little exercise. As we always do, we prowled around the local antique store, and then we popped down to the riverside park for the little people to have a run around. It's great to see so much water in the river again - it wasn't very long ago that the water level was so low. We couldn't believe how many birds were around, playing and calling. When we looked up into the trees, there were so many cockatoos. I think you can see a few in the picture. We were joking around that if one messes on you, it's lucky. Lucky it hit you and not me! I just picked up the fern this morning at Bunnings, and this afternoon I'll plant it into the pot properly. I love a nice Boston Fern. They're virtually indestructible. Much more hardy than the Maiden Hair Ferns that I adore - I have a series of swap-outs of those for when they start looking worse for wear. And my dear sweet Nanna sent me home with some pretty chrysanthemums. I love the colour, they're just lovely. Today was the day for the 'Not the Farmers Wife' sewing girls to meet at my house. We're unofficially 'Not the Farmers Wife' group, because none of us are actually sewing on the Farmers Wife blocks at all any more - for reasons of completion, out of love, or utter boredom! We always have a fun time, and it's great to see the girls - Kay, Claire, Denise, Shay, Val (also Lorraine and Loz who couldn't make it today). I have such a talent for taking blurry photos - don't you envy my mad photography skillz?? There is still a TON of this fabric left in my stash, so I think I may make another of these runners for myself. I'll add it to the ever growing list of Things I'd Like to Make. Today I had a nice surprise waiting by the front door when I came home from quilting. A parcel from the UK - meaning two of my Masons Vista plates had arrived. They're in just perfect shape, and I'm entirely thrilled. My experience so far when purchasing these plates is that items travelling across the globe from the UK arrive in perfect shape, and items that come from other states in Australia arrive in lots of small pieces - baffling really! My goodness things have been busy here these past few days. I've been so exhausted in the evenings that blogging was the very last thing on my mind - oops! On Monday last week after school pickup, Camo, Amy and I visited Ikea. I have no idea why we thought this was a good thing, after school is just fine, but the trip home was MAJOR traffic with everyone coming home from work. The things we parents do for our kids :-). This trip I grabbed some fabric kind of containers (as well as other things) that I thought looked to be a good size for fat quarters. This is the mess that my fat quarters and backing off-cut section had gotten into. It really is an eyesore and needed sorting really badly. Whenever I buy fq's, they're never folded the same way, and I don't mind confessing that I got bored really quickly folding them all again. There are Moda scrap bags stuffed in there, and even a fq bundle from when I visited the Piecemakers store in CA in 2000! I thought it too pretty to cut up! Someone save me!! On Thursday evening my dear friend Vicki and I went to our local guild meeting. It was the AGM, and in fun news, she and I have volunteered to be on the Committee this year. We have a lovely bunch of ladies, and it's sure to be really fun. Friday was a shopping and coffee play date with a sweet girl I went to school with, and then in the evening I was getting ready for a big quilty weekend. Vicki and I had signed up through guild for a Gloria Loughman workshop. Do check out her website, it's just fabulous. We were working on 'It's all about Colour'. We had the very best time, Gloria is a fabulous and very informative teacher. I am often (but not always) a bit of a slowpoke in class, and I didn't get much further than you see below. I'm really excited to get busy working on the diamonds again, but they will have to wait until I've gotten further with my Mrs Billings quilting. That is a huge priority. And speaking of the quilting, here is a small section that I worked on today. I'm just loving how it's coming along. Once I'm done clearning up from dinner and making lunches for tomorrow, I'll get right back into some more quilting. Yay! 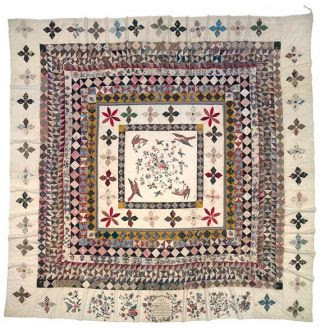 This year from the 15th June to the 22nd of September, the Queensland Art Gallery is holding a wonderful exhibition of quilts from the period of 1700-1945. This will be a must-see event, and I'm going to move heaven and earth to get there if I possibly can. If only the exhibition was travelling to Adelaide! This amazing exhibition features quilts from the Victoria and Albert Museum's collection, quilts loaned from selected UK museums, the Rajah quilt above, as well as other small handmade objects. Click here to visit the main page for the exhibition. And now the main reason for this post: I was contacted by the Press & PR Manager of the Victoria & Albert Museum (seriously!!) to share details of a fabulous fabric collection they have in their Gift Shop. I had no idea they had fabrics, and after checking them out, I know I MUST add some to my fabric collection. 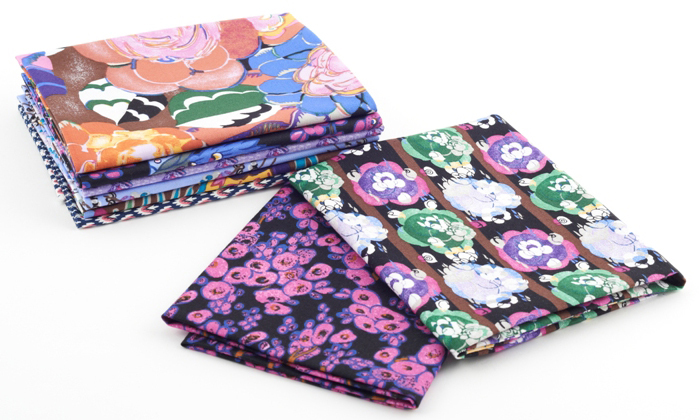 They're a delight for vintage style and modern quilters alike. Visit their shop to see all the lovely fabrics on offer. V&A Fabrics: Fat Quarter Bundles £35 - Available in Teal, Sage, Beige, Fuschia and Coral. Have fun with your fabric shopping - I am advised that they ship worldwide, so click away. And if you get to the exhibition, do let me know all about it, I'm really hoping to get there too. Disclaimer: I was not paid or compensated in any way for this blog post - just very happy to pass on a wonderful fabric source to my readers.